After years of lying empty and recent painstaking renovation the Goldsmith's Almshouses have been turned into 20 luxury homes. The chapel has been converted into a two-bedroom home. The homes will have a list price of £375,000 and have been developed by Charterhouse Standard Holdings. The site itself is steeped in history and dates from the mid-seventeenth century, when it was owned by the famous Goldsmith John Perryn. When he died the land was passed over to the Goldsmiths Company, which in 1811 decided to build a collection of almshouses on the site. Twelve of the almshouses were built that year, with an additional eight houses in 1838. 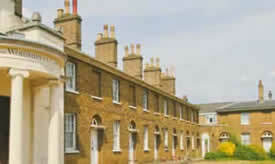 In the 1850’s, when the North and South-Western Junction railway was built right through the common fields of Acton, the Goldsmiths Company sold part of their land on the condition a train station was built to provide a daily service of passenger trains and a lane built up as far as the almshouses. From this, W3 acquired its first station, which is today known as Acton Central, providing a direct link to Kew Gardens within 10 minutes and Richmond within 14 minutes. The Goldsmith buildings were listed in 1981 to protect their architectural value and they are now a major focal point of the Acton Park Conservation area. As part of the restoration of the site, original English orchard features will be fully reinstated, including a comprehensive landscaping package, which will provide walkways through the gardens. In addition to the communal gardens, each house will have a terraced area which will be screened for privacy and the almshouses on the east and west wings will benefit from their own private enclosed courtyard. The houses themselves will be refurbished to the most exacting of standards, overseen by English Heritage, with many stunning original features restored to preserve the historic nature of the properties. The original features will be complemented by contemporary living spaces to create a unique and delightful place to live. An open day, by appointment only, will be held on May 14.